Domaine Pfister began life in 1780 during our Revolutionary War. That seems a long time ago, until you learn that Pfister’s village of Dahlenheim was favorably noted for wine production in the distant year of 884. A written record has survived, detailing how the village supplied wine to the Abbey of Saint Michel de Honan during that era. Dahlenheim was an important center of wine production throughout the Middle Ages as well. It’s located due west of Strasbourg in the northern reaches of the Bas Rhin. If you like wines marked above all by purity of fruit, elegance, and character (to say nothing of reasonable pricing), you have come to the right place. 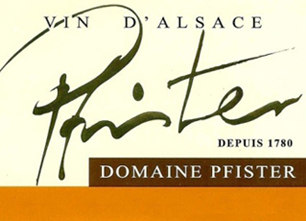 Domaine Pfister farms forty parcels totaling ten hectares (twenty-five acres) of vines, twenty-five percent of which is in Riesling. Mélanie “officially” took over from her father with the 2006 vintage, but dad is far from retiring. He very proudly has got his daughter’s back, and works the vines as hard as he ever did. Alsace, in the far north-eastern corner of France, stands out from other French wine regions thanks to its strong Franco-Germanic influences. The Alsace region lies between the Vosges mountains and the French border with Germany, marked by the Rhine river. A long, thin region, it measures 115 miles north to south and just 25 miles from east to west. The key viticultural areas here are all located on the lower hillsides of the Vosges, on slopes with east and south-easterly aspects. The Vosges play a vital role in defining the region's terroir providing protection from the prevailing westerly winds and also casting a rain shadow over the area, contributing to the low rainfall of its continental climate. Alsace is the only French wine region to grow significant quantities of Riesling and Gewurztraminer. Pinot Gris is another of the region's specialties.